For many sales organizations, the starting bell for Q4 sounded on October 1. Now only two months are left. The heat is seriously on for any sales team that must stretch to achieve their year-end number. Triage is a concept from emergency medicine. Its goal is to focus attention and limited resources on the most urgent cases that can be saved. Here's an example: Eight patients need your attention, but your ambulance accommodates only two. You have to choose which two go in the ambulance. The topic is especially timely for companies that engage in big, business-to-business (or B2B) sales transactions. Q4 is challenging because of the holiday season. Because it takes a lot of resource and effort to close a big deal, you need to budget your resources carefully. Resources are especially constrained when everyone's trying to close business at the same time. So double down on your commitments to a few carefully chosen deals. Think where to focus the limited time and attention of your senior executives. In which deals should you "bridge" them to their counterparts on the customer side? Remember, the procurement organization in your customer company is also going through their own triage process. They're trying to figure our which deals will go on their list of high-priority purchases to close before the end of the year. If your deal doesn't make it to their short list, you'll be standing out in the cold when December rolls around. Big deals always involve risk and uncertainty for both buyer and seller. On the seller’s side, the risk that the deal will close late – or that it won’t close at all – increases as more decision influencers and business units get involved on the buyer’s side. The chances of losing a deal to indecision are about one in four. Last year, 23% to 24% resulted in no decision, according to CSO Insights. The one-point difference was between the highest- and lowest-performing sales organizations. Other studies have shown the risk of indecision is as high as 60%. The odds of losing a deal to a competitor are about the same as a coin toss. The average win rate for forecasted deals was about 48% in 2015, CSO Insights found in another study. Top-performing sales teams achieved 51%, and the worst performers 41%. Slow economic growth and the election year are likely to increase the risks and uncertainties for deals occurring in the United States. So you may close even less than half of the deals you're counting on. That's why triage is so important. It focuses your company's time and attention on your best deals first. You hold your more doubtful deals aside until you’ve attended to the ones on your short list. 1. Quickly assess the opportunities in your pipeline. Identify the deals you must win because of their size or their importance to your company. Evaluate which of these you have the best chance of winning. Distrust the forecasts your sales reps have provided. Remember, most forecasts are less reliable than a coin toss. Be skeptical. This is no time for wishful thinking. 2. Handicap your most important deals. Allow a margin of safety to allow for your team’s typical close rate. Suppose you need an additional $2 million to achieve your quota. Add a margin of safety to allow for any quota credit you may lose during negotiations with the customer. If you add a 20% for safety, your target becomes $2.4 million. If you achieve a better-than-average close rate, you’ll be solidly in the quota club. Spread your risk across several deals if you can. Put your eggs in a few baskets. If you find you don’t have enough good opportunities to reach a combined value of $5.0 million, you have a different set of problems. 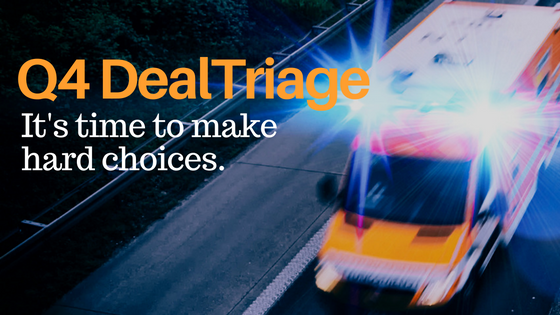 Triage is still helpful, but it’s not enough. Next time around, you must fix your lead generation and sales prospecting processes. 3. Double down on resources. Make sure you short-listed deals get the resources and management attention they need. Fast track them for resources such as pre-sales consulting, engineering, technical consulting, professional services, proposals, financial review, legal review, and so on. Unless you have plenty of unused capacity, don’t waste precious resources on opportunities that haven’t made it through your triage process. 4. Keep a close eye on the deals you've chosen. Coach your sales team to help them win the deals on your short list. Good coaching can increase deal win rates by 9%, according to CSO Insights. Set up a system for weekly – even daily – updates. Be ready to provide any resources you may need to adapt to fast-changing situations. To manage these elements, I recommend a framework or methodology called Sales Compass. It’s a kind of deal-navigation system for managing deals you must win. The framework is lightweight and portable. You can use it anywhere without need of special software, forms, whiteboards, or other paraphernalia. The Sales Compass process is fast. You can use it during pipeline review calls. It doesn’t require your team to fill out paperwork. You can review an individual deal in a few minutes. It’s also collaborative, meaning that it involves both sales managers and sales reps in creating appropriate strategies and tactics. Everyone learns. You can use it with any sales methodology, including The Challenger Sale, Strategic Selling, Solution Selling, Customer-Centric Selling, Solution Selling, Baseline Selling, SPIN Selling, and Sandler. Sales Compass has helped about 15 companies close millions of dollars of incremental business in the past five years. It probably works to your advantage that the method isn't more widely known. You can get details from my friend and business partner, John Stopper of Northstar8 Performance Strategies. Sales Management Optimization Study 2016. CSO Insights. Sales Performance Optimization Trends 2016. CSO Insights.